Beautifully engraved uncancelled stock certificate from Commerce One, Inc. issued in 2002. This historic document was printed by the Security-Columbian Banknote Company and has an ornate border around it with a vignette of the company's logo. This item has the printed signatures of the Company’s Chairman of the Board and Chief Executive Officer, and Senior Vice President, Gerneral Counsel and Secretary, and is over 9 years old. Commerce One was a pioneering e-commerce company founded in 1994 as DistriVision in Pleasanton, California. The company was renamed Commerce One in 1997, and went public in 1999. They were one of the darlings in the hot B2B (business-to-business) sector, and saw their stock soar from 20 to over 600 in early 2000, before it collapsed in the dot-com crash. In 2001, the company acquired Veo Systems from Asim Abdullah for $300 million. One of the company's technologies was SOX, an XML schema technology that influenced the development of the W3C's XML Schema language. The company filed for Chapter 11 bankruptcy protection on Oct. 6 2004 . In December 2004, a portion of its patent portfolio was sold by a bankruptcy court to JGR Acquisitions, a subsidiary of Novell, Inc., for $15.5 million. The remaining business interests, including all remaining intellectual property rights to the software, together with a patent license from JGR, were sold to new investors that continued to operate the company as Commerce One. 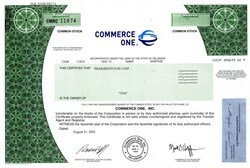 Commerce One formally announced on February 7, 2006, that it had been acquired by Perfect Commerce – a provider of On-Demand Supplier Relationship Management (SRM) Solutions and The Open Supplier Network. Commerce One, LLC is a wholly owned subsidiary of Perfect Commerce, LLC, a Virginia Limited Liability Company headquartered in Newport News, VA with an office in Paris, France.